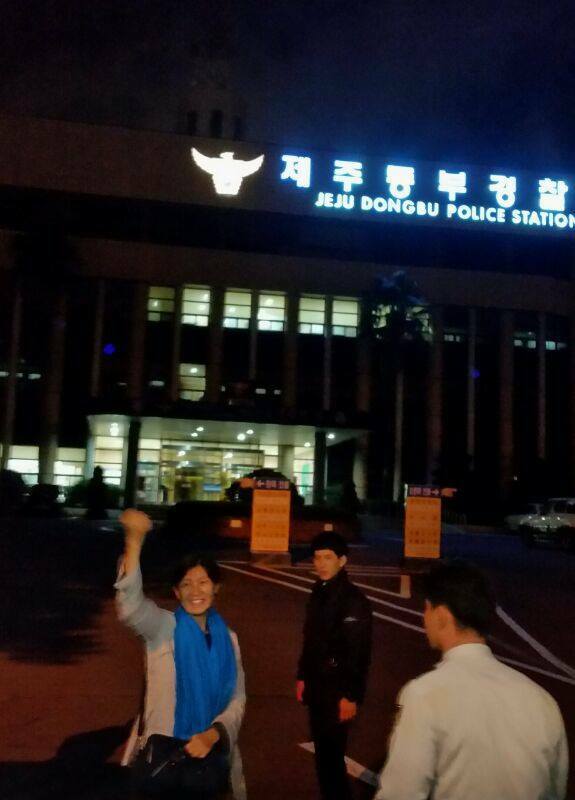 I, Sung-Hee Choi, enter 12 days’ prison as of today’s date, October 13, refusing to judicial oppression and enforcement of fines on me. (600,000 KRW, about $600 USD), even though I think that I am no-guilty. 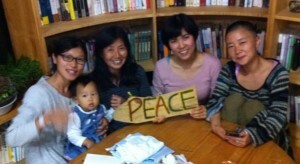 It is not because I agree with imprisonment but I intend to expose the coercion of the judicial oppression on the protesters against the Jeju naval base project through my unjust imprisonment. One of the events that I have been indicted was that of November, 8, 2011 when Dr. Song Kang-Ho, Kang Young-Sil, and I were arrested under the charge of refusal to leave during our nonviolent peaceful and silent protest in the Samsung-owned Shilla Hotel where the UN-ROK joint conference on Disarmament and non-proliferation (a part of so called ‘Jeju Process’) was being held. Dr. Song was especially violently dealt by police during the arrest. Despite the unjust situation at the time to violently arrest three of us, the Supreme Court dismissed my appeal at the end of this August and the Prosecutor Office has sent me a notice on enforcement of fines as a result of the court decision of guilty against us. I made this decision because I thought that I need to inform people that the struggle of Gangjeong is not only keeping to go on but also facing a new urgent stage (Please think that the base construction is planned to be completed in 2015 and the US has set up the plan on the attack on China in 2017). Above all, I want to emphasize the currently continuing unjust trials that have stifled many villagers and activists here. I have seldom known such a record of judicial oppression in any other places.. More than 650 numbers’ arrest. More than 550 numbers’ indictment, and more than 43 cumulated numbers of imprisonment so far! My appeals to the higher and Supreme courts have all been dismissed. However, Dr. Rebecca Johnson (UK) has thankfully sent an urgent letter to the 1st court right after our arrest. Benji D’Amour, who was threatened with deportation just for being with us on November 8, 2011, was to get injunction the next year (March 14). Three years later, I am very infuriated by the news of UN Security Officers’ oppression on Gangjeong peace keepers who were to have a campaign in the CBD on October 9 this year. Has the UN become NATO-like? Has not the UN Human Rights Council declared on the individual’s rights to make effort to promote basic freedom and human rights, as well as protection and realization of them? Has not the UN Human Rights Council stipulated on each state’s responsibility and duty to provide condition and legal guarantee for such individual rights and efforts? I hope the chance of my very brief imprisonment gives clue on our deteriorating democratic rights throughout the world, as well as the momentum to consider more ways of strengthening our global solidarity.